As a longtime fan of Five Hundy By Midnight the Original Las Vegas Podcast I thoroughly enjoyed host Tim Dressen's new book The Outsiders' Guide to Las Vegas. The book follows the premise that obsessive outsiders often know more about Las Vegas than well intentioned locals. After losing count of how many cab drivers have told me Cosmopolitan is part of CityCenter, I couldn't agree more. The Outsiders' Guide has a very similar tone and style as the podcast - unfiltered opinions wrapped in humorous commentary. This is a complete guide covering every aspect of a Las Vegas vacation from the planning stages all the way to returning to work after your trip. Tim goes through every Strip, near Strip, and Downtown casino giving his take on what's good (Jackpot) and what's not (Tilt) at each property. While reading through each hotel rundown I couldn't help but take notes on what restaurants, shows, and attractions that I want to check out next time. One interesting section of the book is the "Time as Currency" concept. When you're on vacation time is more important than money in some cases. Taking the shuttle from Harrah's to Rio is free - but it will cost you an hour of time, which is much more valuable than the $10 you would have spent on a cab ride. 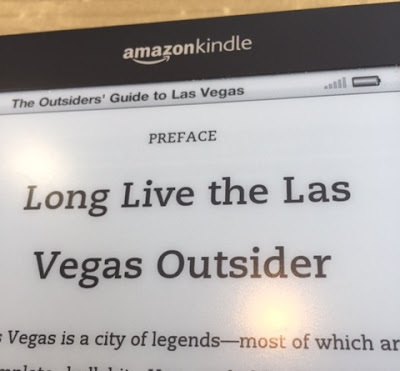 I sincerely recommend The Outsiders' Guide to Las Vegas to experienced and novice travelers alike. Be careful sharing this book with uptight coworkers or family members though, it's definitely rated R.
I'll be looking forward to reading whatever Tim Dressen writes about next, but I do have a suggestion for his next book: The Las Vegas Ghost - A Novel.